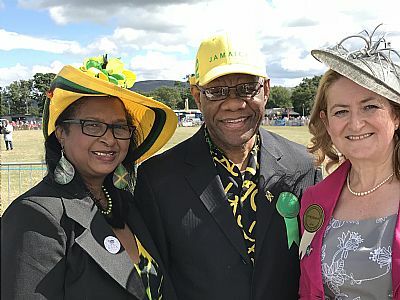 The Jamaican High Commissioner, His Excellency Seth George Ramocan and his wife, Dr Lola Ramocan, with the JHC Community Relations Officer, Mrs Vivienne Siva, made a historic 3 day visit to Wales in August 2018, at the invitation of Learning Links International, to ensure they had opportunities to understand the shared history of Jamaica and Wales in order to challenge the negativity of past approaches and to help to find new ways to reconcile the understanding of the many strands of history that link Jamaica and Wales. The tour started in Cardiff where His Excellency was welcomed at the Royal Wales College of Music and Drama, meeting representatives of the Welsh Government and local people who have Caribbean heritage. The Jamaican delegation also met with business representatives involved in importing Jamaica produce today and recognising the long history of the banana boats that brought fruits and vegetables to Wales. Further time was spent meeting local people in the Bute Town, the area once known as Tiger Bay. The next leg of the tour involved travelling up to North Wales to explore Jamaica’s educational and historical links with Bangor and Denbigh. The Jamaican delegation was received by the Vice Chancellor, Professor John Hughes, and welcomed by Pro Vice Chancellor, Jerry Hunter, who has responsibility for Welsh Medium and Civic Engagement. He also met staff from Bangor University, who are currently active in project work in Jamaica, before visiting the collection of Penrhyn Papers secured in Bangor University Archives. See photo above. 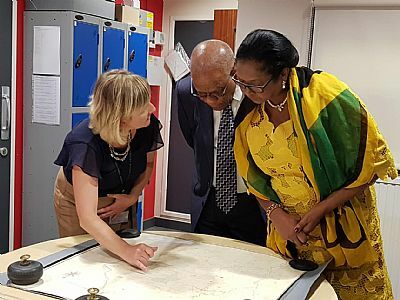 Elen Wyn Simpson, Head of Archives and Special Collections, showed the High Commissioner a range of maps of Jamaica from the collection which covers the time when the local Pennant family managed their plantations and the enslaved African workforce in Jamaica. His Excellency and his wife were driven to Penrhyn Castle and welcomed by Rhian Cahill, Visitor Experience Manager, and other National Trust staff and volunteers who were able to show the delegation the Pennant family portraits and to provide an opportunity to experience the awesome extravagance of this incredible building. Penrhyn Castle is recognised as a monument to sugar and slate, not only to the endeavours of the enslaved African workers, but also the efforts of the quarrymen who toiled in Bethesda in the harshest of conditions provided the enormous wealth needed to build and furnish such a vast building. The work of the local craftsmen and women was also recognised and the use of local Welsh oak, stone and slate from the estate and Anglesey marble. 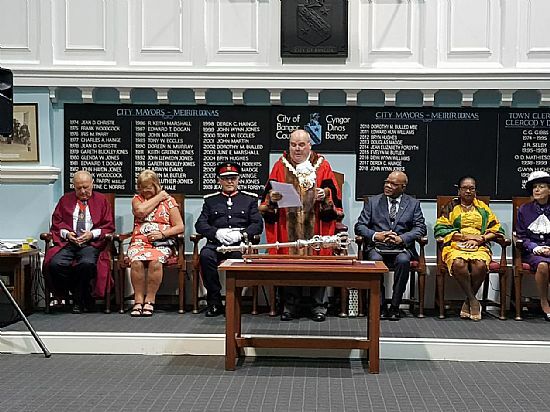 Preparations had been made by Bangor City Council and invitations were sent out for a special Civic Reception which was hosted by the Mayor of Bangor, Cllr John Wynn Jones, and the City Council in Penrhyn Hall. Local dignitaries including the Lord Lieutenant of Gwynedd, Edmund Bailey, and High Sheriff of Gwynedd, Kathryn Griffiths Ellis, were waiting to receive the Jamaican High Commissioner and his party. Guests were impressed to see the formalities and protocols carefully followed to pay due respect to the Jamaican delegation. Mayor, Cllr John Wynn Jones, welcomed the High Commissioner and his wife, and outlined the plans underway to create civic links between the City of Bangor and May Pen in Jamaica, sharing the progress being made between himself and May Pen’s Mayor, Cllr Winston Maragh. He explained the significance of the historical connections between both areas. Various presentations were made to exchange gifts formally. His Excellency, Seth George Ramocan, thanked the Lord Lieutenant and the Mayor, before making a presentation to put the shared histories into context, emphasising the need to understand and take responsibility for providing information about the history of Atlantic Slavery and the need to move forward positively into the future. He said he was grateful that the Pennants Plantation papers had been given to Bangor University, who he felt were making every efforts to make them accessible, and he said he looked forward to opportunities for more academic cooperation to enable the stories to be told. His Excellency also welcomed the establishment of the Jamaica Wales Alliance, which is supported by Learning Links International. Specialist historian, Dr Marian Gwyn, representing Race Council Cymru and who had organised the day’s proceedings, introduced members of the Hogia’r Bonc Choir from Bethesda, who provided a spirited range of Welsh songs, before John Wyer, Chair of the North Wales Jamaica Society, added his comments. Welsh poet, Dr Rhys Trimble, presented a Welsh praise poem, then performed a poem he had written in Jamaica, when taking part in a Welsh delegation visit in 2016 to explore the development of the Jamaica Wales Alliance. After this the National Poet of Wales, Ifor ap Glyn, introduced himself and recalled the opportunity he had in Bethesda to work with Jamaican Dub Poet, Yasus Afari and Rhys Trimble, before sharing two poems. Liz Millman, who established Learning Links International, thanked the High Commissioner and his wife for accepting the invitation to visit Wales and recognised one of the Jamaica Wales Alliance projects involving Rotary groups in May Pen and Bangor, who are exploring ways to gain funds to undertake much needed work to improve the facilities in schools in the community of Pennants in Clarendon, Jamaica, where the Pennant Family Great House was situated surrounded by their sugar plantations. The Civic Reception ended with the Isle of Anglesey Choral Society singing Calon Lan and leading the singing of the Welsh and Jamaican national anthems. The final leg of the tour was much more relaxed, with a visit to the Denbigh and Flintshire Show, to acknowledge the significant heritage link with the Denbigh Agricultural Show in Jamaica. Both Mr Ramocan and his wife showed their sense of fun, wearing bright Jamaican colours to the delight of their hosts and other visitors to the Show. In November 2017 members of the North Wales Jamaica Society and Learning Links International were invited to meet the Jamaican High Commissioner to discuss developing the idea of the “Jamaica Wales Alliance”. In the meeting with His Excellency, Seth George Ramocan, Deputy High Commissioner Angella Rose-Howell, and Vivienne Siva, Community Relations Officer, the idea of a JHC delegation visiting Wales was suggested. Liz Millman, Director of Learning Links International, has worked since then with the JHC to engage with organisations in South Wales and linked with Rev. Lester Freckleton from Vale Community Church, and Race Council Cymru. In North Wales, City of Bangor Council, Bangor University, the National Trust at Penrhyn Castle and the Denbigh and Flintshire Agricultural Team agreed to support the visit and to give the JHC and his team the opportunity to have a “taste” of Wales. Vale Community Church agreed to put on an evening community meeting for local people from the Jamaican community. Race Council Cymru linked with the Royal Welsh College of Music and Drama, who agreed to manage a welcome for the JHC delegation with an opportunity for the Black History Elders to share the story of the Windrush Project, as well as inviting representatives of the Welsh Government. Dr Marian Gwyn worked with Bangor University to plan to welcome the JHC delegation and provide an opportunity to showcase the Penrhyn Papers at the University Archives. 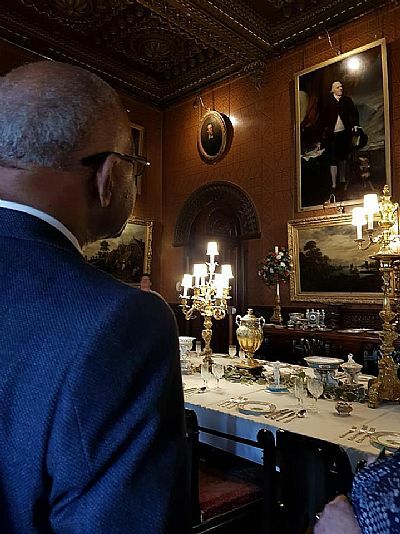 The National Trust agreed to welcome the JHC delegation and members of the North Wales Jamaica Society to visit Penrhyn Castle. The Mayor of Bangor has agreed to host a Civic Reception for the JHC delegation and distinguished guests. The Denbigh and Flintshire Agricultural Show team agreed to host the JHC delegation and members of the North Wales Jamaica Society to their Annual Show held on 16th August. The initial aim of the Jamaica Wales Alliance was to establish formal links between Wales and Jamaica, in a similar way to the approach being taken by “Flag Up Scotland / Jamaica”, but with places and organisations in Jamaica and places and organisations in Wales. As yet most links are informal, but the visit of the Jamaican High Commission team is taking the initiative forward in a more formal way. A delegation visit to Jamaica was organised in Sept 2016 by Learning Links International CIC, to explore the potential to create the Jamaica Wales Alliance.This was supported by Jamaican poet, Yasus Afari, who has been a real activist in terms of Black History activities in Wales, and he set up the programme of meetings and visits. The delegation was made up of members of the North Wales Jamaica Society, including John Wyer: Chair, Dr Rhys Trimble: Welsh Poet, Audrey West: Jamaican Language Specialist and Liz Millman, who heads up Learning Links International. Meetings with representatives from the Institute of Jamaica, the Museum of Jamaica and the Jamaica Memory Bank resulted in strong links being established. Jonathan Greenland, Director of the Museum of Jamaica, is from Penarth and he has agreed to be the Jamaica based co-ordinator of the JWA. The Welsh delegation also visited the Jamaican Commission for Cultural Development and the University of the West Indies, which is based on the Mona Campus in Kingston. Meetings were arranged with the Mayor of May Pen, who enthusiastically embraced the idea of developing links with the City of Bangor, especially related to shared histories and Heritage tourism. The Denbigh Show Ground, the base of the national two day Agricultural Show, is in May Pen. Visits were made to the community of Pennants in Clarendon to meet the Principal of John Austin Primary School, as a small grant had been pledged by the Pennant family trust. The British High Commission in Kingston supported the development of the Jamaica Wales Alliance and provided a lunch reception for the delegation and the people who had supported the visit. A further visit to Jamaica was made in June 2018 by Liz Millman, to meet up with the new Mayor of May Pen to make progress with the Civic Link, and also to meet with the CEO of Clarendon Council to explore links with Gwynedd. As a Rotarian from Bangor Rotary Club, Liz also met up with members of May Pen Rotary Club to secure their support to apply for a Global Grant to improve the educational facilities in the village of Pennants, where the Pennant family had their Great House. The first joint activity was the “Irie Pesda” which was funded by Arts Council Wales, enabling research into links between Welsh and Jamaican poetry, bringing Jamaican and Welsh Poets together, involving Director of the Jamaica Poetry Festival, Yasus Afari, and innovative Welsh poet Dr Rhys Trimble, along with Ifor ap Glyn, National Poet of Wales, Karen Owen and Natalie Fagan Brown. Also as part of the Black History Season in 2016, the social and cultural exploration of Jamaica continued with events in Bethesda, as part of the first “Irie Pesda Festival” celebrating Wales love of Reggae music with an evening tribute to Count Ossie ( Oswald Williams) in 2016 and the Jamaica British links in Liverpool and Manchester. In 2017, the Irie Pesda Festival showcased reggae artiste, MackaB as part of his World Tour “Health is Wealth” and building bridges with the Jamaican community in Wolverhampton and Birmingham. Since then, links have been forged between the City of Bangor, Gwynedd, and May Pen, Clarendon, with Mayor of Bangor, John Wynn Jones, exchanging introductory emails with Mayor of May Pen, Winston Maragh. The City of Bangor Council supported a recognition event on Windrush Day 2018, recognising the contribution made by Enrico Stennett, a Jamaican campaigner who came to the UK and then settled in Wales. The Chartered Banker MBA programme team at Bangor University already have links with in Jamaica to offer distance learning MBA courses and during the course of the JHC visit, several other links were identified. May Pen Rotary Club are getting quotes for work needed organised, to enable an application for a Rotary Global Grant to refurbish the schools in the community of Pennants in Clarendon. The People Collection, Wales, is linking with the Jamaica Memory Bank to explore the Welsh owned plantations in Jamaica, the story of Henry Morgan, the contribution of Welsh teachers and clergy in Jamaica and the history of Eisteddfod in Jamaica. Jamaica Agricultural Society at Denbigh Showground is interested in possible links with Denbigh and Flint Agricultural Show and Young Farmers groups in Denbigh, North Wales.